Phage Genomics research was my favorite class during either semester of my freshmen year. 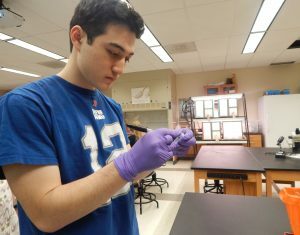 It offered an experience that no other class I’ve taken has offered: a chance to become involved in actual scientific research and to see if research was the career for me. The class provides a great opportunity not only to learn biology in the lab, but also a chance to solve problems that you may have never experienced before. For me, this process of solving these issues was extremely rewarding, despite being challenging at times. A main purpose in the first semester of the course is to isolate your own bacteriophage, or phage, a virus that infects a specific type of bacteria, from soil samples that you can bring from home or that you find around Hope’s campus. This really makes your work in this class feel very personalized and individualistic. Even though your classmates will be working on the same procedures, because you each isolate a different phage, there will likely be different steps you take within those procedures, and it can be exciting to figure out what specifically you will need to do in order to isolate your phage and its DNA. The second semester of the course is a bit different. Instead of doing wet lab work, you will be primarily work in the computer lab in order to analyze the genomes of several phages that you or your classmates had isolated in the previous semester. This work, though challenging at first, is extremely rewarding when you make a new discovery or make a breakthrough on a problem that had previously stumped you. Phage was a big reason that I decided to come to Hope College. The opportunities it provides were a draw for me, and I am not disappointed with my decision to take this course. I now am looking forward to a career in biology research, and I am actively involved in summer research in biology. If you’re looking for a chance to do real scientific research straight out of the gate when you get to college, I cannot recommend taking Phage enough to anyone interested in biology.